So I’ve started Muay Thai training. Honestly, I had no idea either. And this is far, far outside my comfort zone. Let’s take a step back. For the past year, The Assistant has been taking Brazilian jiu-jitsu classes at Crispim BJJ. He loves it, and it’s excellent for him. It’s done wonders in terms of physical development and confidence, but also his willingness to lead and learn from other kids his age through sparring and partner activities. 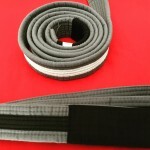 He recently graduated to his gray belt with black stripe, which was a very big deal for him. Needless to say, I’ve been very happy with the gym. 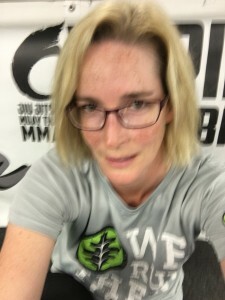 So last year, during a school fundraising auction, I saw that they had donated two packages: a month of adult Muay Thai and a month of adult jiu-jitsu. I wanted to support the gym and run up the value of the package a bit by pushing it to the top of the list. Oh, crap. Now what do I do? Well, the first thing was to ignore it for a while, which is easy to do when you’re rarely home for an uninterrupted month. But August rolled around and… hey, I’m home for five whole weeks. It was time to give it a try. It’s been a long time since I’ve felt that awkward and clueless. But fortunately, Joe (the instructor) was patient and tolerant. (He’s also from Philly. We have a bond.) He explained things, demonstrated, and tried his best to show me what to do. How do I describe this? Well, it’s kind of like kickboxing, which I’ve done before. Except my past kickboxing classes were cardio kickboxing, and much more about rhythm and choreography than form. This is… not that. This is clearly rooted in fighting. In just two classes I’ve learned a lot about form and function. Why do I hold my hands here? So I can’t get sucker punched. Why turn my foot that way? So I don’t fall over if my opponent grabs my leg. Do I like it? I think I do. 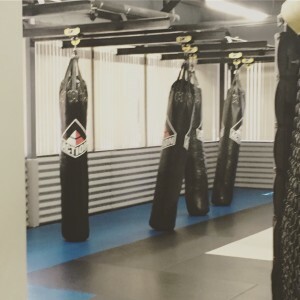 I much prefer working on the bags than sparring with a partner, mostly because the bag doesn’t hit back, and I don’t feel guilty about hindering the quality of its workout. It doesn’t have to go easy on me. It just hangs there and takes whatever I have to give, good or bad. And I kind of like being able to beat the snot out of something, particularly on a frustrating day. How do I feel? After the first class, my hips were killing me. My friend said that it’s bursitis, but I just called it Old Lady Hips. And yet, when I went back into class two days later, the second class fixed my hips. They’ve been fine ever since. My calves, however…. What’s the verdict? I’ll definitely go as often as I can through the introductory month. And as long as Joe is willing to put up with me, I may even be willing to go beyond that, though at 40-something and female I am clearly not the demographic for this. But then again, it’s too soon to make plans. What’s that Mike Tyson quote? “Everyone has a plan until they get punched in the mouth.” For once, that’s a literal possibility. Muy Thai sounds really intense. I’d love to hear what you think after your month is up. I have a Bondi Band which doubles as a headband and a bit of a sweat-stopper if I place it correctly, but I have so many layers in my hair that it all still manages to flop forward. I need to grow it in so it can be contained by the headband/elastic combo.